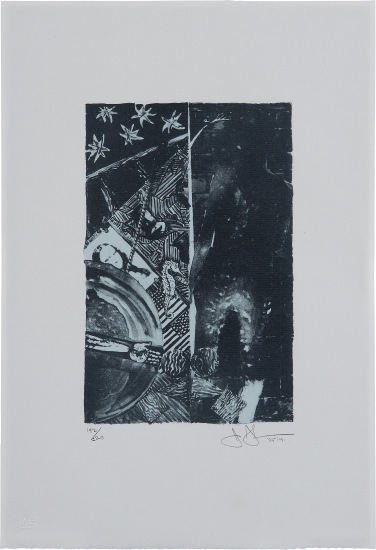 Jasper Johns is a painter and printmaker who holds a foundational place in twentieth century art history. Quoting the evocative gestural brushstroke of the Abstract Expressionists, Johns represented common objects such as flags, targets, masks, maps and numbers: He sought to explore things "seen and not looked at, not examined" in pictorial form. Drawing from common commercial and 'readymade' objects, such as newspaper clippings, Ballantine Ale and Savarin Coffee cans, Johns was a bridge to Pop, Dada and Conceptual art movements. Beyond the historical significance, each work by Johns is individually considered in sensuous form. A curiosity of medium led him to employ a range of materials from encaustic and commercial house paint to lithography, intaglio and lead relief. Executed in 1991, this work is number 182 from an edition of 225 plus 19 artist's proofs, published by Brooke Alexander Editions, New York.